After receiving this booklet, I thought it may be a bit thin (at 56 pages) for the subject. After reading it, I realized it well covered the intended subject. For those of us interested in the heraldry and markings of WWI, aircraft books such as this are essential. Although the WWI colors and markings of the British are probably the least involved of all the Allies, the importance of such cannot be underscored. 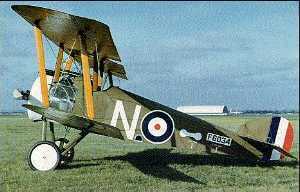 The British had fairly standard national markings. They also lacked an attempt to camouflage their craft outside of a coat of green- brown paint. The author, renowned aviation historian Bruce Robertson, covers the subject in detail with chapters from: General Finishes to Trademarks and Component Markings. Over 130 photos and diagrams are used to illustrate the detail and component markings of the subject. Also, four color plates by Ray Rimell show the typical WWI British aircraft finishes. Most importantly they show color examples of the significant colors used by the British. Anyone who lacks the rare 'Methuen Book of Color References' (the bible of color reference showing a number reference for all shades and colors) can sorely use the accurate color swatch reproductions that are included in the plates. The only addition I would have liked to have seen would have been the addition of unit and squadron markings - though covering this would have doubled the size of the book. As the second installment of the WINDSOCK FABRIC SPECIALS (the first covering the von Richthofen Jagdgeschwader) it does justice to its intended subject. The members of this series are a must for any serious historian's library. Additionally, they are required for the scale modelers and other artists involved with WWI aircraft. If these are your area of interest I recommend get this book. You can order the book through Albatros Publications Ltd., 10 Long View, Chiltern Park Estate, Berkhamstead, Hertfordshire, HP4 1BY, Great Britain, for 14.95 Pounds (about $26.00).